Laurier’s Sustainability Office will offer lunch bike rides to students, staff and faculty every Tuesday during the month of June to celebrate Bike Month. The rides will stop at Ethel’s Lounge for lunch, where participants will receive a 10 per cent discount and a chance to win prizes each week. Rides will be departing from University Ave. and Mid-Campus Dr. 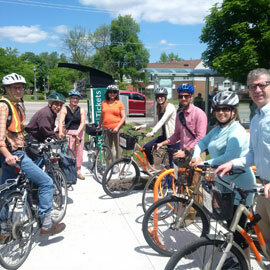 This is the second year the Sustainability Office is hosting lunch bike rides during Bike Month. Ride participants are welcome to bring their own bikes or borrow one from Laurier’s Community Access Bikeshare bike sharing station. Bikeshare bikes will be available for free on a first-come, first-served basis. Rides will leave at noon on June 7, 14, 21 and 28. As space is limited, participants are required to register. On June 7, VeloFix, a mobile bike shop, will be stationed at University Ave. and Mid-Campus Dr. from 11:30 a.m. – noon for free bike tune-ups. Join in the conversation online using #LaurierBikes #BikeMonth. For more information on Laurier’s sustainability initiatives, visit wlu.ca/sustainability.